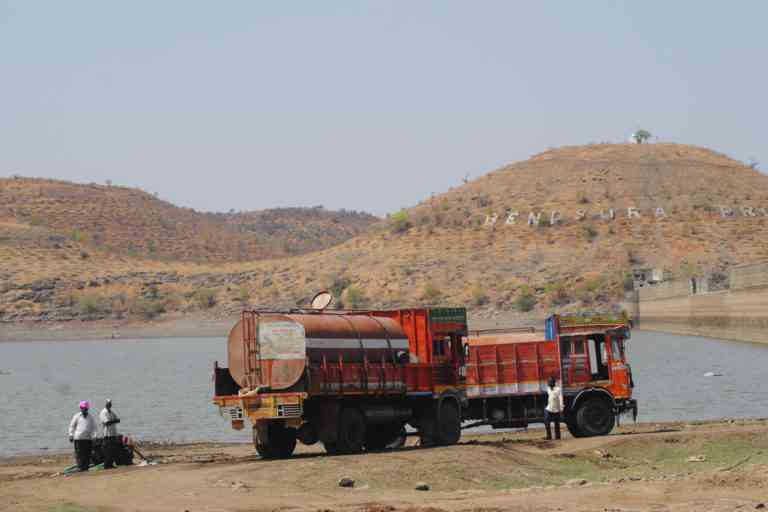 Tankers fill water at Bendsura dam in Beed district. (Photo credit: Meena Menon). At Chorala village in Bokardan taluka preparations to collect water begin in the morning, hours before the tanker is scheduled to arrive. Steel and plastic pots and drums of varying sizes and colours are stacked in rows around a small cement tank. This village of over a 1,000 people, is divided into four wards and each day two wards have a go at collecting water. There is a buzz of anticipation and decibel levels rise as the tanker arrives at 10.30 am near the temple to discharge its precious load. 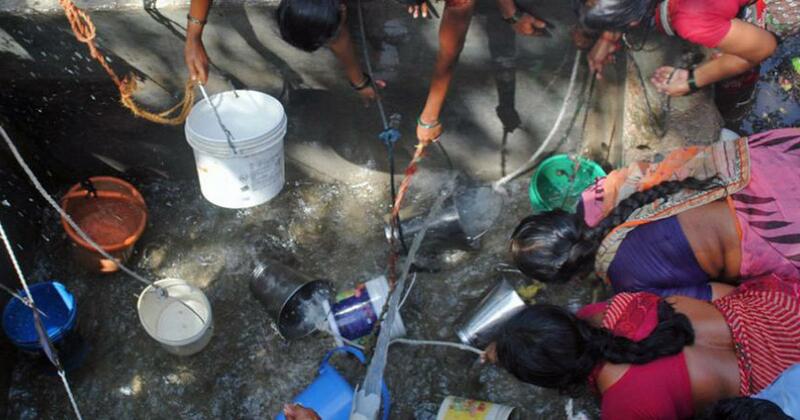 Soon women from rival wards stake a claim for water and there is an argument. In the next 20 minutes, as soon as the tank is full, women arch backwards and throw their buckets with ropes attached into the tank and bend almost in unison to frantically draw water. Some men help too, but most of them stand and watch or quell arguments. As the water level goes down, you can hear the sound of steel buckets scraping the bottom for those last few drops. 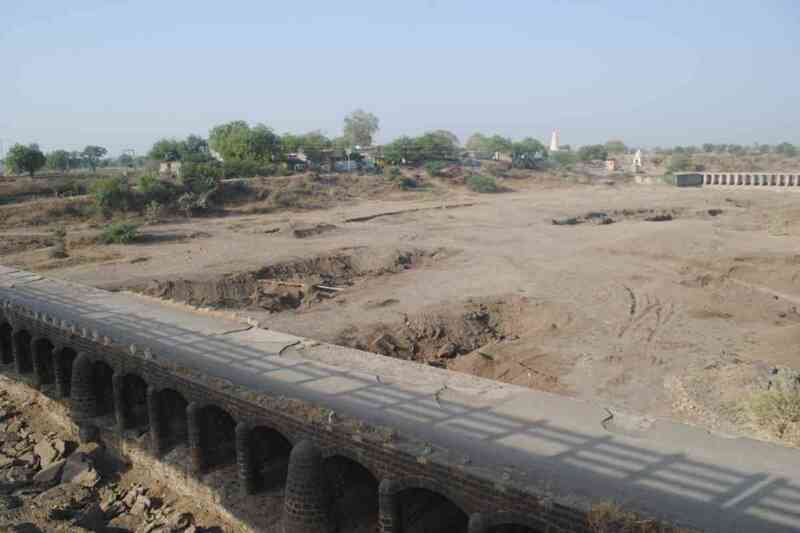 While many villages in Bokardan taluka have piped water under the government Jal Swarajya and other schemes, they are out of use due to the lack of water. This time there is no water in most places in Marathwada region, very little provision for fodder, and no work under the employment guarantee scheme either. With poor monsoons in 2018, the kharif crop yielded little, and there was no sowing during the rabi season when most of the millets are grown for fodder. The major cities and towns in the region like Aurangabad, Jalna, Beed and Osmanabad get water once in a week or once a fortnight. There, plastic cans for sale with filtered water and water ATMs in some places ease the water scarcity. But it is in the villages that the impact of the drought is stark. Though the state government declared the list of drought-affected villages in October, there is a clear and present absence of any vision or planning to handle this crisis, especially since six of the eight Lok Sabha seats in the region are held by the Bharatiya Janata Party and Shiv Sena alliance. Raosaheb Danve Patil, the state BJP president and four-time MP from Bokardan, presides over a seat that is virtually bereft of water and has no cattle camps worth the name or any employment guarantee scheme work. Beed is the stronghold of the late Gopinath Munde, which is now held by his daughter Pritam Munde. Madhav Bhandari, BJP spokesperson for Maharashtra, told Mongabay-India that the situation was very grim and will worsen in the coming days. There were a lot of problems in Marathwada, especially as groundwater levels were diminishing and water was getting contaminated. This time there is a twin strategy to deal with cattle – fodder depots would be set up along with cattle camps in some places. Water conservation works which have been carried out did not have an impact as there were no rains for the last two years, he added. Kamala Lokhande, sarpanch of Chorala village said tankers were supplying water to the village from February 2018. Even in earlier years since 1992, the village has often been serviced by tankers. There is no water for irrigation here and in the kharif season, the people got barely 10% to 15% of the usual harvest. From 10 quintals of cotton an acre, farmers managed only two quintals. Ganesh Shinde said he used to get 40 quintals of cotton from three acres but now it had dropped to 11 quintals since a few years. Fodder is in short supply and he is spending Rs 7,000 to bring it in from Vidarbha, only to keep his cattle alive. Vishnu Lokhande, a local farmer and contractor, said people were migrating every day for work, though there was no permanent migration as yet. The village has to wait for the tankers, which arrive at midnight sometimes due to load shedding, which extends over 14 hours. There are many bore wells here too that are dry. This area was famous for its chillies but now there is nothing, he added. Mathura Shinde said till a few years they did get piped water but now taps were out of use. “If nature is against us, what can you do,” asked Ashok Dhabade. Not all villages get tanker water. In Babhulgaon, a nearby village, water is piped from the Danapur dam 12 km away for its 2,300 population, and they get it once in 10 days for less than 10 minutes. The 200 wells and borewells in the village are dry. There was no rabi sowing on 600 acres of the land in the village. Kaveri Jamdar said water has been scarce since many years and now it comes from the tap once a week for a few minutes.”My family cannot survive on this little bit and we have to buy water. Now its eight days since water has come and we are waiting.” Women pay Rs 100 for a barrel of 200 litres and store water. 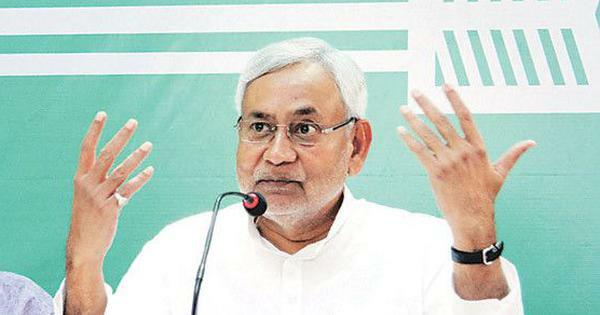 Yet despite the dire situation, there is no work under the employment guarantee scheme here. Mangesh Shinde complained that the farmers were not given the benefits of loan waiver or the Kisan Samman scheme. At such a critical time, the public distribution system has also come in for complaint. Uttam Matkar said that he and others had submitted a complaint to the tehsildar in February 2018 demanding an inquiry into the ration shop owner who is breaking all the rules by overcharging people, not giving proper rations, or displaying the cost of the foodgrains, giving less than what is entitled to people and even selling ration foodgrains in the market. Problems related to linking ration cards and Aadhar numbers were depriving people of rations in Nagzarwadi in Kalamb taluka of Osmanabad district as well and some have not been given rations for six months. “We have no fodder, water and soon there will be nothing to eat as well,” said Ushinder Bhanudas Salunke. “I am entitled to 35 kg of rice a month but some online thing is not working and I haven’t got it since six months,” he said. Others like Anusuya Labad and Prashant Salunkhe too said there were problems of linking the card with Aadhar and so people were not getting rations for some time. While people complained there was no work, official figures for Jalna district state that there were 292 works with about 9,193 people employed on March 28. However, on March 31 there were 100 works employing 3,995 people. The government has requisitioned 503 wells, which have water for supplying to villages, and 357 tankers are in operation as of April 1 in Jalna district. Official sources confirmed there are no cattle camps yet in Jalna district but there was a relief camp for cattle in an old pinjrapole or cattle camp in Jalna town, which the government has now approved. Crop losses over the years and poor rains and rising debt have led to a number of farmers’ suicides in the region. Official figures state that over 6,800 farmers have committed suicide in eight districts of Marathwada region from 2001 to 2018 and the numbers are increasing since 2015. Balasaheb Dake’s father committed suicide in Kajala village near Jalna, in 2015 after his sweet lime crop failed. Now a law student, Dake cannot get over the death of his father. His old home is shut but the 100-foot well next to it has a little water, enough to feed cattle. “Five years ago this was a lively place, we had water, my father was alive and our trees were fruiting, but now all that has changed,” said 23-year-old Dake. Large landowners are also affected. On the side of the road at Kajala, a stoic Radhakrishna Balap watches as his sweet lime trees are cut down with an electric saw. 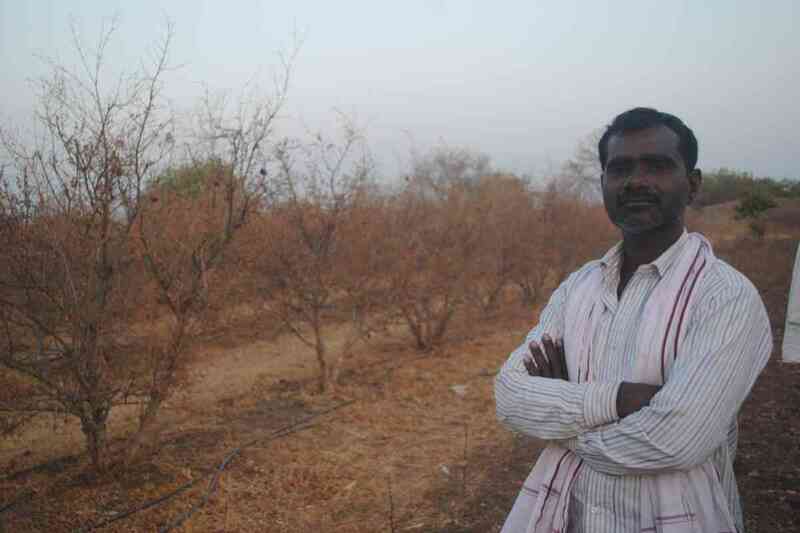 “I had planted 12 acres (of the 45 he owns) with 1,000 trees which are about 10 years old. I can’t sustain them anymore as there is no water,” he said. It will take four days to chop down all the trees and he pays Rs 100 to cut a tree. In a desperate move, he tried to dig a borewell nearby but even at 300 feet, there was no water. Rains have been poor since 2012 and already Balap is in debt to the tune of Rs 12 lakh. Kajala village is full of farmers who are in distress like anywhere else, grappling with crop losses, debt, and now a looming water and fodder shortage. As a result, people are selling their land to survive. Over the years, Bhanudas Jadhav said 30% people have sold their land to people from Jalna town, which is 12 km away, for Rs 3 lakh to Rs 5 lakh per acre. 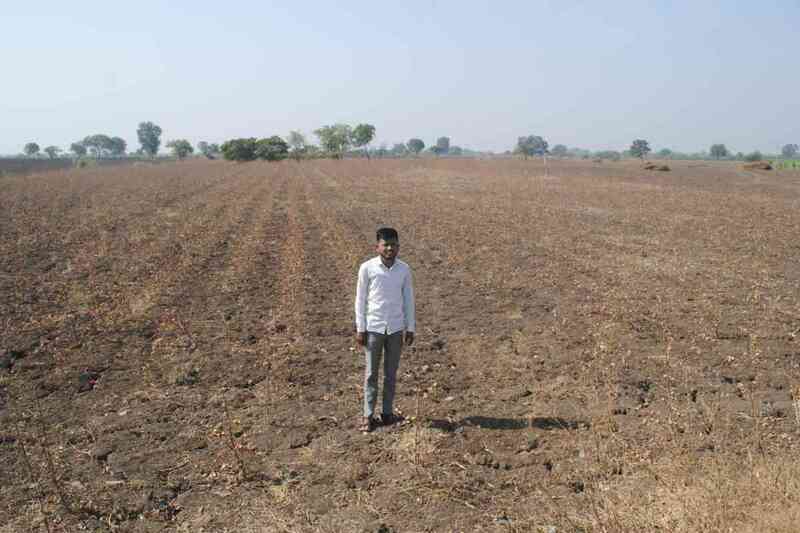 Balasaheb Dake whose father committed suicide in 2015, at his barren field in Kajala village near Jalna. (Photo credit: Meena Menon). In addition to fetching water from water sources 3 km to 4 km away, there is no power supply in the village as people have not paid bills. People like Raghunath Bhorde have been digging borewells, six in all, in the hope of some water. Water levels are below 300 feet and many meet with little success after spending Rs 30,000 for each well. There has been no income from crops after the abysmal rain in 2018 and people are borrowing money to survive. He has also been supplementing this with tanker water for the last two months, spending Rs 1.5 lakh. “The trees are in a situation where they cannot die but they are barely alive,” remarked his brother Deepak. The multitudes of borewells are dry or have water that is not potable. On the way to Chorala village, the wide dry bed of the Purna river is being excavated for its sand in various places. Farmers lament the loss of their crops and many have invested in horticulture. 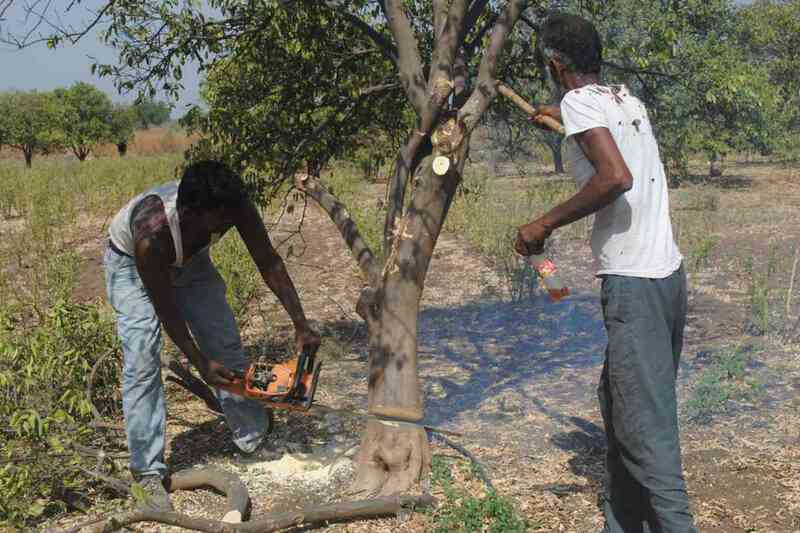 In Karjat village in Jalna taluka, farmers have felt the brunt of the drought with shrivelled sweet lime trees and pomegranate trees and dried grape vines. Vijay Dongre’s field is full of dehydrated sweet limes, which have turned burnt orange. He has 400 trees over three acres and used to earn around Rs 5,00,000 a year. “Now I have to cut them down as there is no point in keeping them – they won’t survive,” he said. He spent Rs 2,50,000 on tankers for two months trying to revive the trees but he has run out of money and the trees didn’t survive. Ankush Bansode’s eyes fill with tears as he gazes on his land with dead grape vines and pomegranate trees. He used to earn around Rs 3,50,000 a year from the fruits but now he is faced with the prospect of uprooting them. Bansode has a family of six people including two children. He wonders how he will survive the next few months. Raju Dongre said the village with 1,700 people gets a per head allocation of 20 litres a day. “Can you survive on that in Mumbai?” he asked. Shaukat Pathan of Babhulgaon village said that people have no fodder, and cattle are roaming around looking for food, or being sold at cheap rates. Though proposals have been given to the government to set up cattle camps, nothing has yet happened, according to Vishal Gade, a local BJP worker. Much like the droughts in the past, some villages get tanker water occasionally but the crisis is over the supply of fodder. There was no cattle camp or chavni in evidence in Jalna district and those who have applied to the administration to set up camps like the Ankushrao Tope Sugar Factory have yet to get permission. The state government does not organise cattle camps and leaves it to private parties and later reimburses them. Cattle camps were up and running in Beed district and a few in Osmanabad were offering some solace. Overall the situation reflected poor management and a lack of planning. Disgruntled people were viewing the forthcoming elections with mixed views: some willing to give the BJP another chance but others wanting a change from the situation of all rhetoric and no action on the ground.